If you follow my blog you will be aware that I'm currently on a 30 day spending ban... don't worry I haven't broken the ban! I purchased a little haul over on the Makeup Geek website a few days before the ban started and they finally arrived the other day! Ok ok I have a confession! I got stumped with a poxy custom charge with these and I will admit I did pay it. You see I just couldn't wait any longer for them and the thought of these sitting in the post office for another two weeks was unbearable and the way I see it was that I wasn't buying anything, this was a charge so I stumped up the cash... £16!!! I've ordered off of the Makeup Geek website twice before and never got charged any customs so I can only presume the reason I did this time was because the package cost more than the previous times and it also weighed more. You can click HERE (all links always open up in a new window) to read my review on the eyeshadows I already own, also this was my second ever post so don't judge! Anyway I picked up four of the Makeup Geek pigments, this is my first time purchasing these and I was super excited to try them out, and also seven pan eyeshadows. At the time of me ordering these, Makeup Geek had a 10% discount code, which is really rare, so I had to take advantage of this offer. Shame the customs charge came to more, yes I'm still not over being charged! 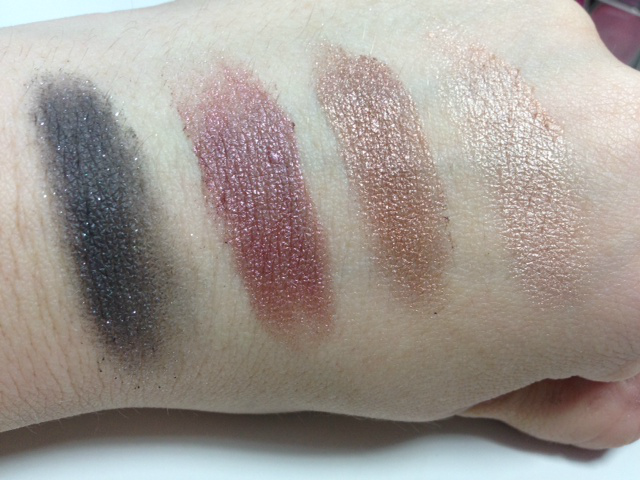 Anyway let's taker a closer look and see swatches... YAY! First off let's talk about the pigments packaging. I love it! 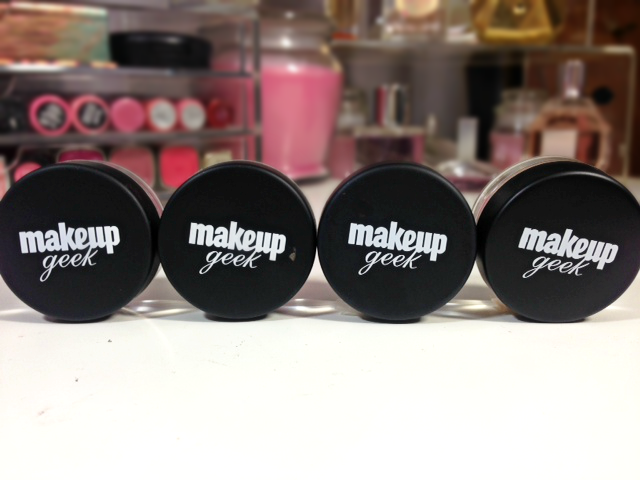 I love the Makeup Geek Logo on the front and the sleek black cap makes it look very highend... BUT the problem is that you have to be soooo careful when opening these as the pigment is literally full right to the top so it's inevitable that there will be some spillage when you first use these. On the plus side the pots are literally full of product, whereas some brands are generally only three quarters full, these aren't! 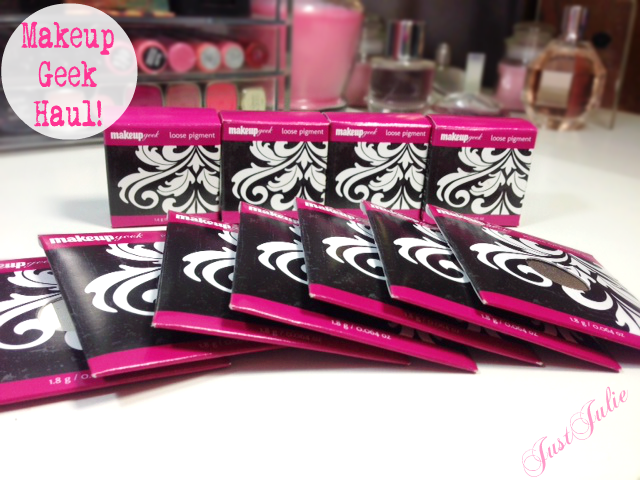 These work out at £4.15 ($6.99) and you get 2g of pigment. So far I've only worn two of the shades once and they applied so easily, were a dream to blend in, the pigmentation was amazing and they lasted all day too! You can also apply these wet with water, MAC Fix Plus or with some eye drops and the colour will really intensify and not budge at all! (check swatches out below) Would I buy more? Damn right I would, even with a custom charge! Shame the other shades I want are always out of stock, but I can see why these are so popular as they are truly beautiful pigments and such great value too. Applied wet. 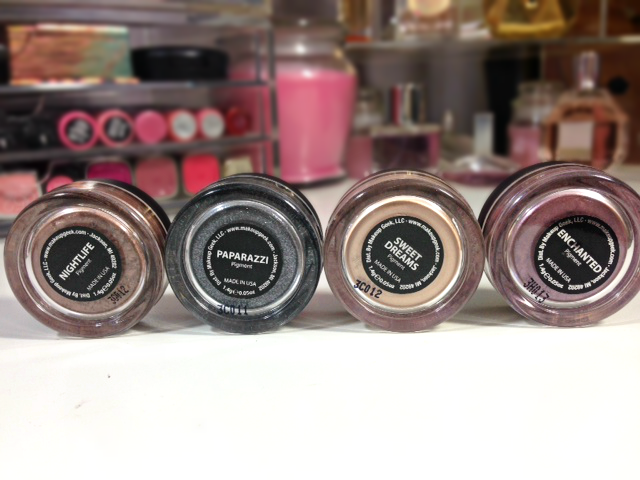 From Left to right: Paparazzi, Enchanted, Nightlife and Sweet Dreams. Paparazzi is a dark smokey grey with glitter particles. It's gorgeous and can be worn sheer or build it up to create a smouldering dark smokey eye. Personally I wouldn't wear this wet as the colour would be way too intense for me. Enchanted is a beautiful shimmery plum colour that can easily be worn alone for just a wash of colour across the eye or with a deep colour. I would wear this wet. Look how metallic it looks wet! I probably would be a little less heavy handed though but it's just beautiful! 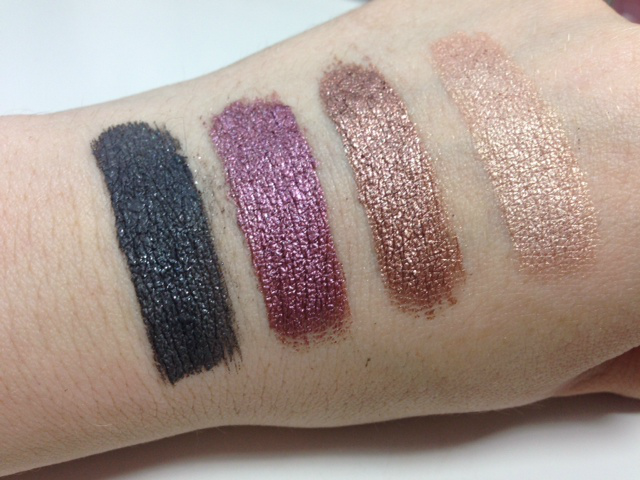 Nightlife is described as light shimmery brown/taupe colour and is one of my favourites out of the four. Again this can be worn alone or as I did, I applied Sweet Dreams all over the lid and then this in the socket and it look lovely. Another one that I would most definitely use wet. Sweet Dreams is a flesh toned colour with a slight rose gold shimmery tint to it. I prefer this colour wet to be honest as it really picks up the rose gold shimmers. This is a colour I think I'll be using a lot as it's so neutral and can be worn with most other colours. You can buy the Makeup Geek eyeshadows in a compact but I prefer them in pan form so that they can easily go in to my Z palette. 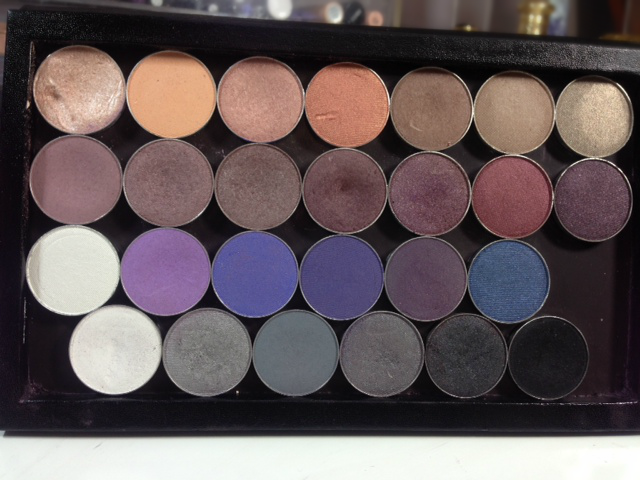 They're the same size as MAC pan eyeshadows so will fit in the MAC palettes too. BONUS! I understand that there is no theme with the colours I've chosen BUT they fit with my now completed palette (picture will be below!) Each eyeshadow pan costs £3.56 ($5.99) for 1.8g of product. 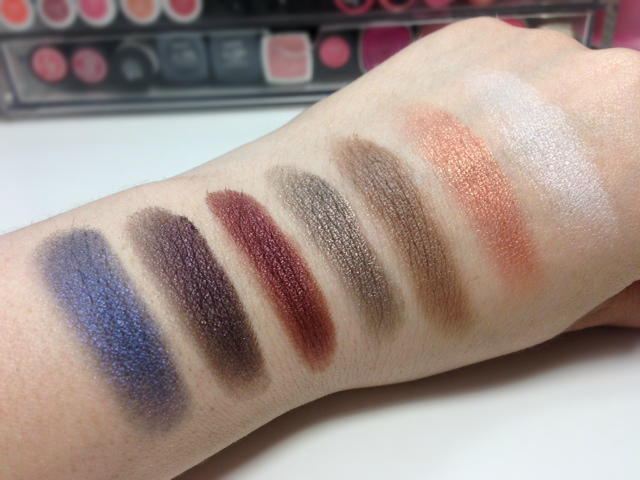 I don't need to tell you how much I adore these eyeshadows, read my previous review and you'll see how much I love them! 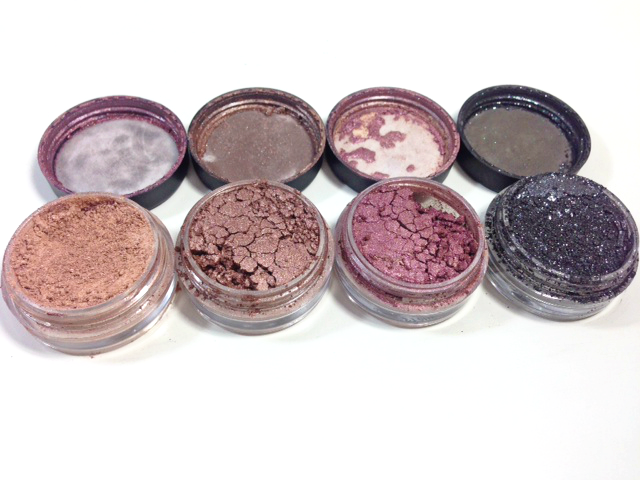 I use these pretty much on a daily basis and prefer them to a lot of my higher end eyeshadows. 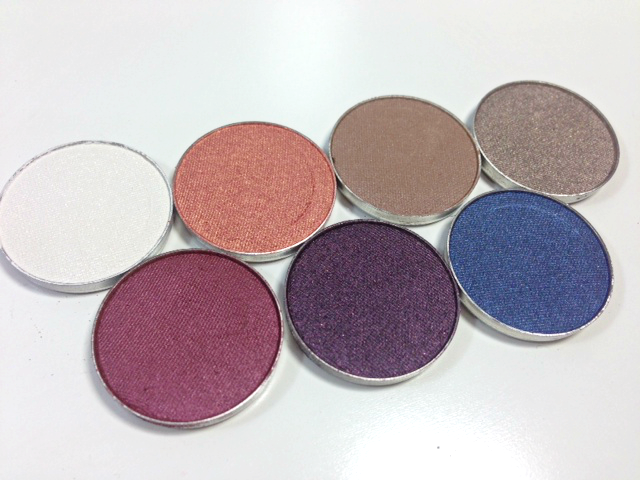 All of Makeup Geek Eyeshadows are also Talc and paraben free and 100% cruelty free! Nautica a gorgeous shimmery midnight blue shade. I can't wait to wear this! Drama Queen an intense dark purple with fine glitter particles. This is actually a repurchase as I broke my last one and love this so much that I couldn't live with out it! Burlesque is a metallic burgundy colour. I have nothing like this so I'm excited to see what looks I can achieve with this. Moondust a metallic taupe with silver undertone. I think I'll be using this colour a lot! Hipster is a medium taupe tan colour. I'm not too wowed by this, I'm not really into tan colours but thought I'd try it out. Cosmopolitan is a shimmery rose gold colour with fine glitter particles. I'm not really sure when I'll wear this but I just thought the colour was too unique and pretty not to buy! Ice Queen is a shimmery white shade. There is pretty much a shimmery white shade in most brands so it's nothing unique. It's very subtle, which I like as it can be used as a highlighter not just on the eyes but on the face too.